On July 28, 2013, the next class of candidates will be inducted into the Baseball Hall of Fame in Cooperstown, N.Y. We won’t know until January if the likes of Barry Bonds, Roger Clemens or Curt Schilling will be considered worthy of enshrinement by the Baseball Writers Association of America — the finicky electorate charged with settling such matters. But a vote held during Major League Baseball’s annual winter meetings in Nashville earlier this month found three men from a bygone era deserving of inclusion. To bestow that posthumous honor, the Hall of Fame turned to, among others, Burlington’s resident baseball historian, Tom Simon. Simon sat on a special subset of baseball’s veterans committee, the pre-integration panel, which was convened to argue the merits of candidates active in the era before Major League Baseball allowed nonwhite players. The 16-member panel included a mix of former players, including Hall of Famers Bert Blyleven, Don Sutton and Phil Niekro; executive personnel; and two historians, Peter Morris and Simon. They eventually gave baseball’s highest honor to New York Yankees owner Jacob Ruppert (1867-1939); umpire Hank O’Day (1862-1935); and bare-handed catcher Deacon White (1847-1939), chosen from 10 candidates of the late 1800s and early 1900s deemed to have been overlooked by previous HOF voting bodies. “Along with my wedding day, being part of this panel was the most amazing experience of my life,” says Simon, 47. 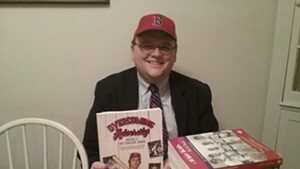 Simon, a local attorney, is the author or coauthor of several books documenting baseball’s earliest eras. Last year, he published The Wonder Team in the White City at the Intercollegiate Baseball Tournament of 1893, in which he tells the story of the University of Vermont baseball team in the 1890s. In those days, Simon relates, UVM was a powerhouse squad regarded as one of the dominant teams in the history of collegiate baseball. Simon is also a founding member of the Vermont chapter of the Society for American Baseball Research (SABR). Baseball, and particularly the game’s rich history, is his great passion. That and his demonstrated expertise led the Hall of Fame to come calling this fall. Candidacy for the Hall, whether as a player, manager, umpire or executive, is considered by weighing six specific criteria: record, ability, integrity, sportsmanship, character and contributions to the game. In evaluations of modern players — suspected steroid use aside — statistics can paint a relatively black-and-white picture of who belongs in the Hall. But one can make no apples-to-apples comparisons when weighing the accomplishments of players such as White against those of an umpire such as O’Day or an exec such as Ruppert. Coming up with a way to compare those individuals, both with their contemporaries and with subsequent generations, was the pre-integration panel’s great challenge. So how to compare them? How do you translate stats from those who played in an era when it took five strikes to strike out a batter — or eight balls for a walk — into those of the modern three-strike era? And what to do with nonplayers such as Ruppert and O’Day, for whom there are no measurable statistics available? “You look at contributions to the game,” Simon says. Given the era under consideration, that challenge demands the expertise of historians. Their own contribution was not lost on Niekro, who credited Simon and Morris in remarks to the Associated Press following the panel’s vote. “It’s tough to go back into the 1800s and bring that to life,” said the famed knuckleballer, now 73. Niekro isn’t alone in his appreciation for Simon’s ability to revive a past era. Simon says he and Blyleven became fast friends during the deliberations, which Simon likens to being sequestered in a jury. He says the former Twins ace, 61, pumped him for info during meetings and dinners. Simon isn’t allowed to discuss specific arguments for or against candidates. But he can speak to their accomplishments. For example, he says Ruppert made two huge contributions to the game. For starters, he was the guy who bought Babe Ruth from the Boston Red Sox in 1919. “Arguably, that’s one of the most important things that happened in the history of baseball,” says Simon. Ruppert’s other major contribution was financing the original Yankee Stadium out of his own pocket. Though it was dubbed “The House That Ruth Built,” it was Ruppert’s money that gave the Yankees their fabled Bronx home in those days before public financing was used to build arenas. His offering provided the grand stage on which the team would become the winningest in American sports history. “It’s designed as a second chance, a review committee,” says the HOF’s Horn. He adds that voting criteria for the Hall have changed several times over the years, so individuals who were not elected under previous guidelines may measure up by the current yardstick, revised in light of research by historians such as Simon. Both Simon and Horn reject any suggestion that committees such as the pre-integration panel exist simply to get more people into the Hall. Even under evolving guidelines, they say, only the top 1 percent of potential candidates will be elected. “You have to be beyond exceptional,” says Simon.